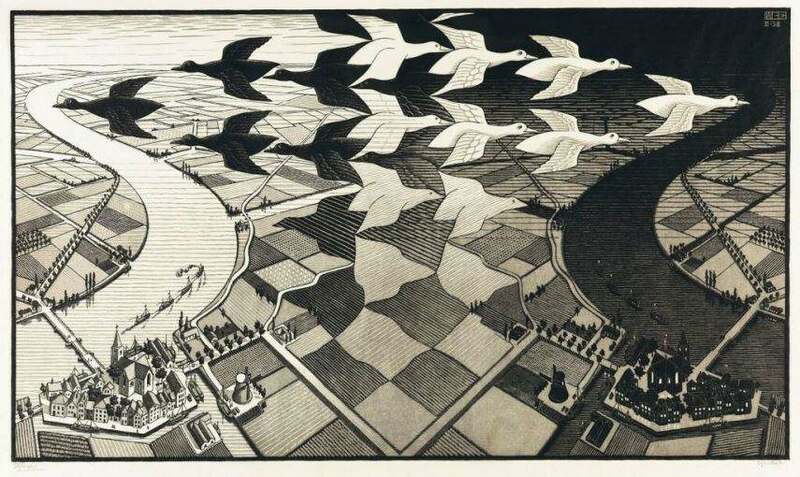 Maurits Cornelis Escher (commonly known as M.C. Escher) was never celebrated as a “big star” of the 20th century art (particularly during his lifetime), mainly because he operated at the fringes of the art world. On the other hand, his works are among most popular images created in modern art. This master of illusion and paradox, best known for his amazing graphics, has remained remembered as a creator of fascinating worlds of transformed reality (as he perceived it), thus producing a beautiful visual language that keeps to fascinate. Dulwich Picture Gallery is organizing a major retrospective of original works by M.C. Escher, entitled The Amazing World of M. C. Escher, which will be a unique opportunity to see all the original works by this master at one place. M.C. Escher used different techniques in his art. 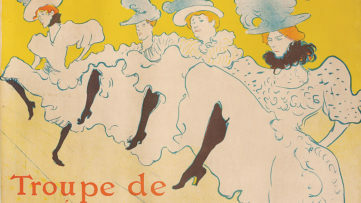 Although often labeled as graphic illustrator, he was not concentrated on one single technique. During The Amazing World of M. C. Escher, the visitors will be able to see original drawings, iconic and lesser known prints, lithographs, woodcuts and archive material – all of them highlight the artist’s supreme skill as a master draughtsman and his unparalleled technical ability. When it comes to his style, M.C. Escher is probably best known for using mathematics and mathematic schemes on compositions. 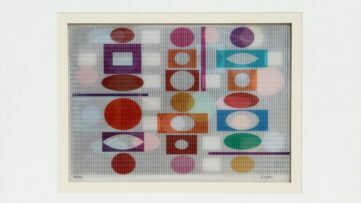 Although the artist did not have any mathematical training, his work had a strong mathematical component (since his understanding of mathematics was largely visual and intuitive). But, how M.C. Escher became so interested in geometrical and mathematical forms that are one of main characteristics of his work? In 1936, the Dutch artist visited Granada, Spain, and the famous Alhambra palace from 14h century. He became enraptured by the Moorish fortress’ tiled walls of tessellated mosaics. He coined the phrase regular division of the plane, describing his technique of tessellation which enabled him to express eternity and infinity in a single print (if you like mathematics and geometry in art, be sure to check out works by Nelson Saiers or James Turrell). M.C. 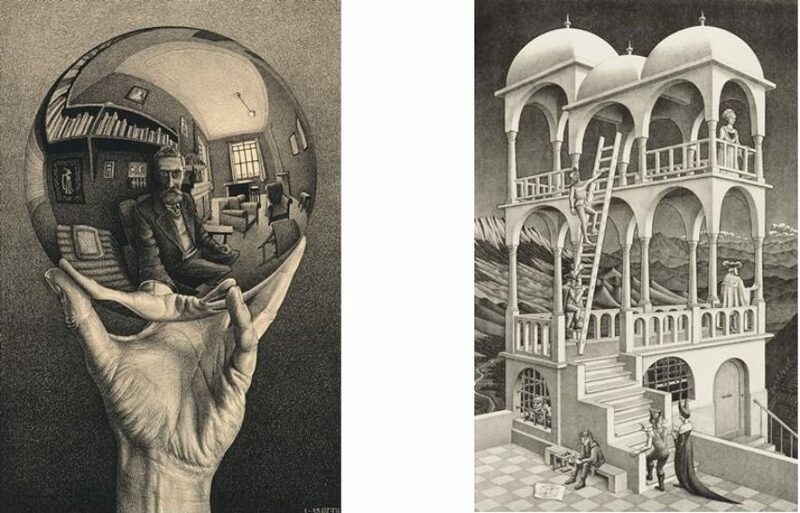 Escher world is one of playful imagination and the unexpected, executed with mathematic precision to create impossible, timeless realities that would inspire amazement in the viewer. In some of his best known works, like Metamorphosis II, Ascending and Descending or Waterfall, we can see a beautiful play between the two dimensional and the three dimensional, between art and reality, and between the “real”, the reflected and the imaginary. 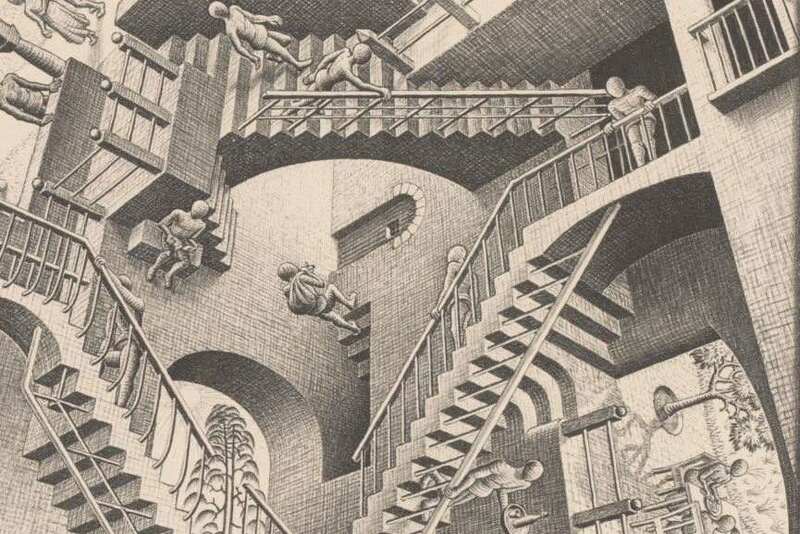 Escher’s art has become quite popular, and even became a part of the popular culture. His images have appeared on album covers (Mott The Hoople), his concepts in films both classic (Labyrinth) and contemporary (Inception), and countless homages to the artist have surfaced on television (The Simpsons, Family Guy). The Amazing World of M.C. Escher at Dulwich Picture Gallery is the first major UK retrospective of original work by this great Dutch artist. The exhibition comes to Dulwich following its run at the Scottish National Gallery of Modern Art. 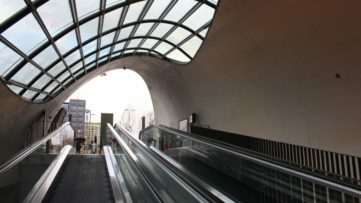 It will showcase over 100 works as well as previously unseen archive material from the collection of the Gemeentemuseum Den Haag, The Netherlands. Arranged chronologically, the show stretches across Escher’s whole career. The Amazing World of M.C. 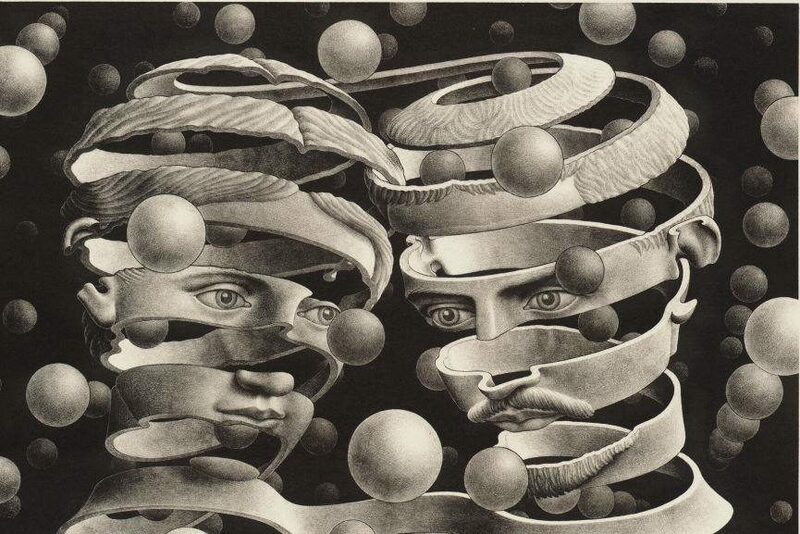 Escher will be on view from October 14, 2015 until January 17, 2016 at Dulwich Picture Gallery in London. All Images courtesy of Dulwich Picture Gallery. Works of Geometric Abstraction For Your Wall!